i’m ooo and can’t answer my emails rn. aka i’m living up this labor day weekend in southern california! visiting my fave, eating the good things, basking in beachy sunsets. 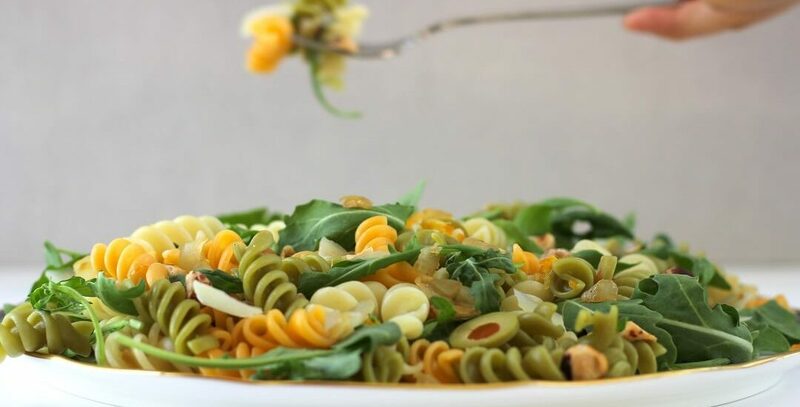 in case you need a last minute side dish for labor day though, how about this olive pasta with kumquat vinaigrette?! 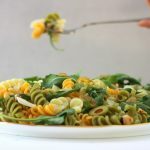 i’m on a huge citrus kick right now, and i love how citrusy this pasta salad is. i used preserved kumquats that my aunt pickled, but preserved lemon would also be really tasty here. there’s the salty olives, which we all know i could eat a jar of plain. 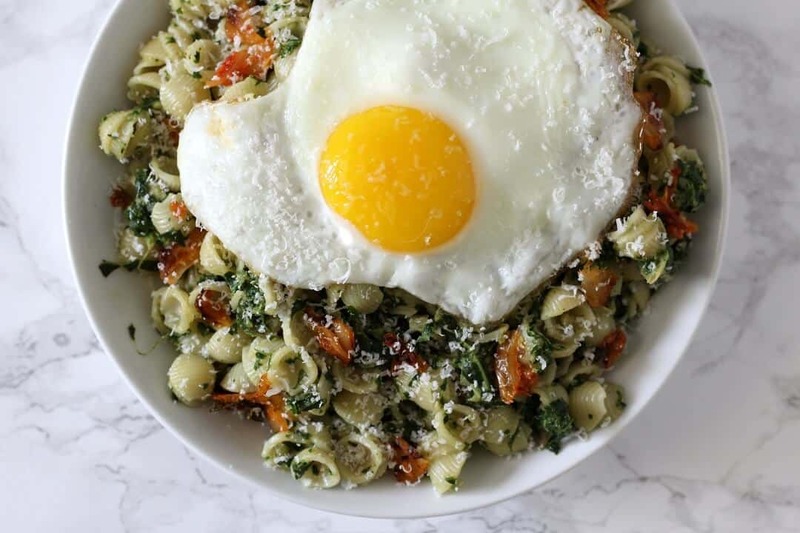 there’s arugula, which i normally find too peppery, that mellows out and breaks up all the pasta when the two get tossed together. i was lazy and didn’t grate the parm here; do as i say and not as i do. when you grate it, it infuses into the pasta so much nicer. and let’s be real, hazelnuts make everything better. i have a bag in my freezer and bring out a handful for special occasions like this. 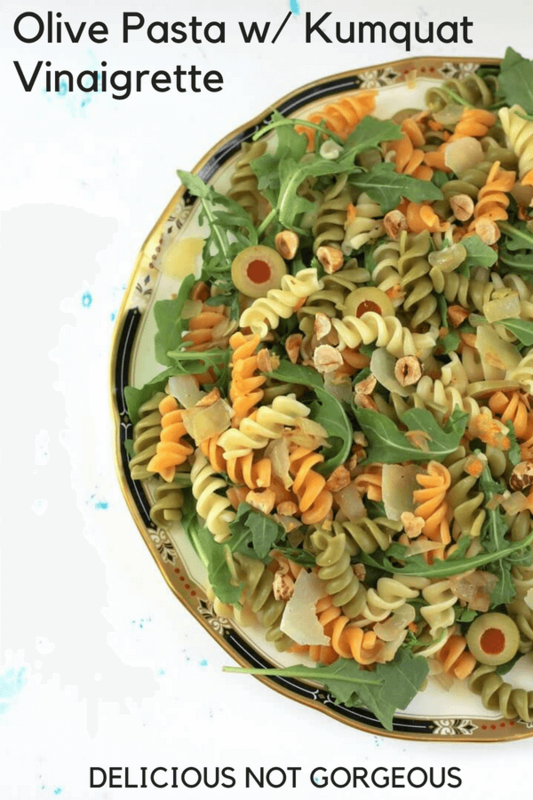 This olive pasta with kumquat vinaigrette is a tasty make-ahead pasta salad. 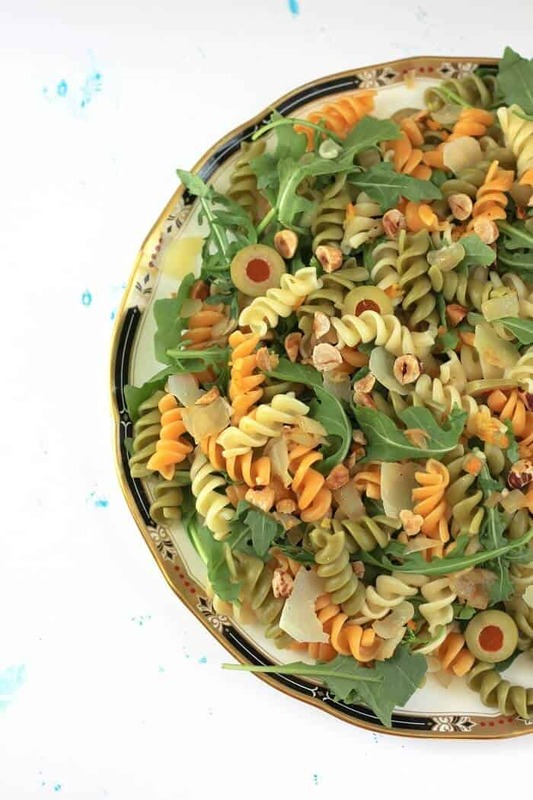 Just toss in the arugula and hazelnuts at the last minute, and you're good to go! Cook the pasta in a large pot of boiling salted water according to package directions, until the pasta is done to al dente. Drain. In a medium skillet over medium heat, heat some oil. Add the onion and a big pinch of salt. Saute until the onion is translucent, then add the garlic. Saute until the garlic is fragrant. Whisk the oil, lemon juice, lemon zest and kumquats together. Toss in everything else and serve warm. Don’t have preserved kumquats? You can sub in preserved lemon. 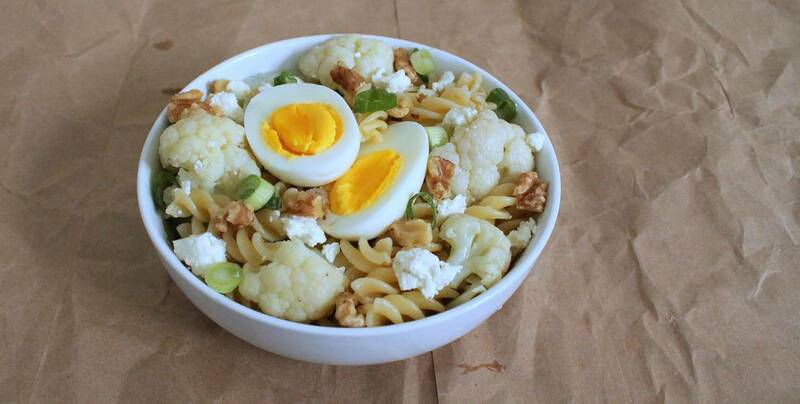 Heather – what a lovely pasta dish! I love all of the flavor notes here – citrus, salty, spicy. So so much flavor! Hope you have a fantastic SoCal weekend! thanks, laura! i feel like pasta salads can be bland so i wanted to make sure this was super citrusy and that the dressing was almost too intense alone. Such great flavors! Peppery, salty and there’s pasta so I’m sold! I love a citrusy pasta! I’ve never thought to use kumquat, but it’s a brilliant choice. Wonderful delicious flavours in this dish. kumquat’s a fun choice because i never use them, but anything citrusy (especially lemons or limes) works! What an intriguing combination of ingredients! Wow a Kumquat vinaigrette! that sounds so exotic!! I love the citrus and sour and salty flavors here!! This is possibly my favourite of yours yet, Heather! I am an olive fanatic! thanks katherine! and oh, not enough people like olives (: i need a friend to go raid the olive bar with! Kumquat vinaigrette sounds so interesting! What a great idea, I’d love to try it. Kumquats! Ha! I never ever think about those little guys (I think they’re little? lol)… SO way to put them in the spotlight with your recipe!! they’re super tiny! have you seen finger limes before? i’ve never seen then in real life (only online lol) but i think they’re even tinier. Welcome back to SoCal for the weekend! Love that citrus can be incorporated in our everyday meals. I like how you’ve given the pasta so much life through these few fruits!